The 137th anniversary of the first officialy documented baseball game in Cuba was celebrated in the Palmar de Junco Stadium in the province of Matanzas with the unveiling of a plaque marking the historic event of December 27, 1874. MATANZAS — THE 137th anniversary of the first officially documented baseball game in Cuba was celebrated in the Palmar de Junco Stadium in the province of Matanzas with the unveiling of a plaque marking the historic event of December 27, 1874. Retired player Leonardo Goire, Dr. Félix Julio Alfonso López and Olga Lidia Ramírez revealed the plaque located at the entrance to the stadium. During the celebrations of the historic event several activities were held including a panel debate on the official character of the first game in Cuba headed by journalist Reynaldo González Villalonga. “Historically it has been recognized that the first organized baseball game in Cuba took place on December 27, 1874 since it was the first time that uniforms, umpires and rules were used, and for the first time the results of the game were published in the press,” said lawyer and historian Alfredo Santana, author of the book El inmortal del béisbol. 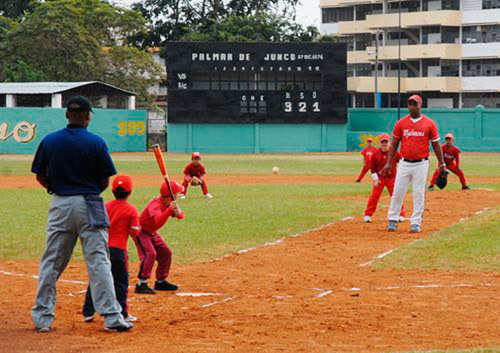 Other activities held to remember the date were a lecture on baseball training hosted by several teachers from the Camilo Cienfuegos University of Matanzas, and a symbolic game was held on December 27 at the stadium between two children’s teams.